Written by Georg Holzmann on Nov. 17, 2012 in News. Do you want to process huge amounts of audio or video files in one single step? That's why we built the new Auphonic Batch Production Interface! It allows you to start multiple productions with an existing Preset and can be used for file-based, automated batch processing of audio file collections. Please see Managed Processing of Audio and Video Archives for bigger datasets, customization and dedicated hardware. First you have to select multiple input files and one preset. A preset stores common metadata, output file formats, outgoing file transfers and algorithm settings for your productions. All input files will be processed with settings from the preset. You can choose multiple audio or video files from your local computer, via HTTP or from External Services (FTP, SFTP, Dropbox, SoundCloud). We support all common file types and will inform you if your format is not known. In a second step, you may adjust some metadata of your productions. 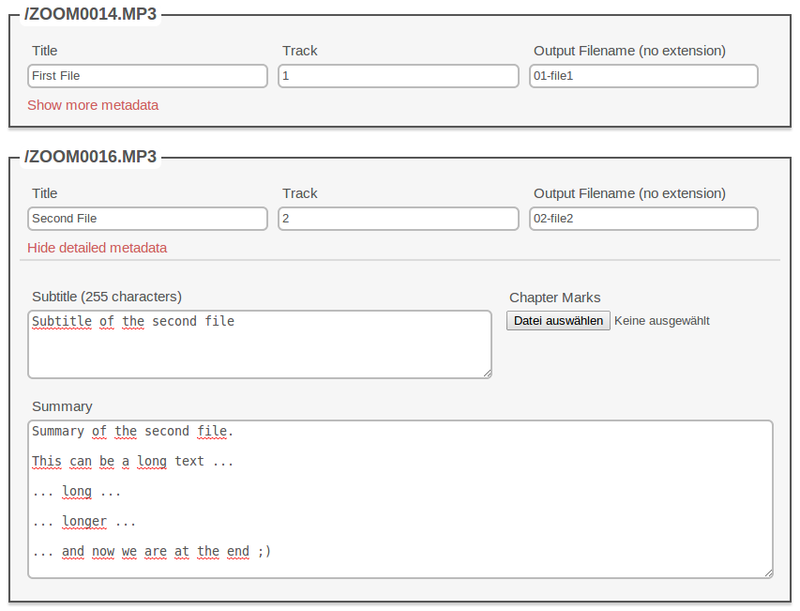 It' possible to set individual titles, track numbers, output filenames, subtitles, summaries and chapter marks. This will overwrite the metadata of your preset. NOTE: Metadata tags, chapter marks and cover images from input files will be imported automatically in empty fields! That's it – now you can start all productions with one single click! If you need any further features or metadata fields, please let us know. However, for really complex use cases we recommend to use the Auphonic API. Try it yourself: Auphonic Batch Production Interface !